Our Cedar Park 5K is less than a week away and momentum is building! Two Timbers tickets go to 7th grader Lily S.
Nike backpacks going home with: Alison H. (6), Molly D. (7), Merry R. (6), Aaralynn F. (6), Amelia W. (7), Kincaid M. (6), Sophie H. (7), Ben B. (7), Jake S. (8), and Caden J. (7). Students winning an awesome Orthopedic and Fracture Specialists hydroflask: Dexter C. (7), Maxima D. (6), Demi S. (6), Matthew C. (7). The following students have won a Noodles & Company gift card: Ella F. (8), Quinn N. (6), Charlotte M. (7), Daphne Z. (6), and Kylie B. (6). These students now own a MOD pizza gift certificate: Amy R. (6), Summer W. (6), Grace G. (6), Drew N. (7), and Samantha P. (7). Finally, Eliana S. (7) has just won a Baskin Robins ice cream party for her advisory! Less than a week before Cedar Park's 5K on Thursday, 10/4. Our corporate sponsors have been very generous and together added $10,000 to our fundraising efforts! That brings us our current gross total over $27,800. Keep it up Cedar Park!! When you patronize the following businesses, please thank them for supporting excellence in education in our community. VOLUNTEER: Come cheer, help and share in the community that is Cedar Park. If you would like an official volunteer shift, sign up here: Volunteer shifts are live for the 5K on Thursday, 10/4. OFFLINE DONOR RECEIPTS: Find them right here. MATCHING FUNDS INFO: Head to www.cedarparkptc.org/matching for an employer search engine to see if your company will match your generous donation. We also have Nike, Intel, and Columbia instructions that take you step by step through the process. Let's work smarter, not harder, Cedar Park! 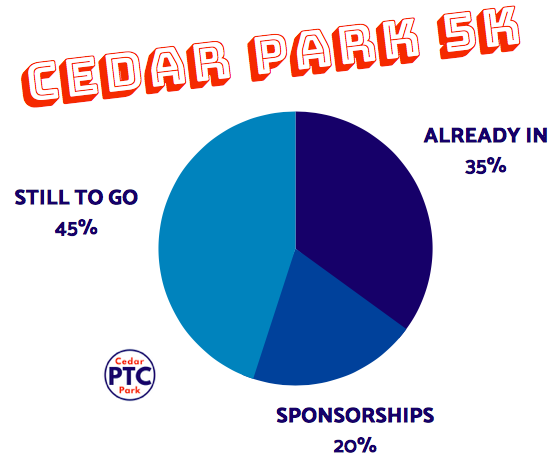 MORE QUESTIONS: Check out www.cedarparkptc.org/fundraising or chat with Karen (cedarpark5K@gmail.com). Subscribe to our blog and receive the latest PTC news straight to your inbox. Your tween might not share, but we sure will. We respect your privacy & your inbox. You'll only receive one email a day, no matter how many times we post.